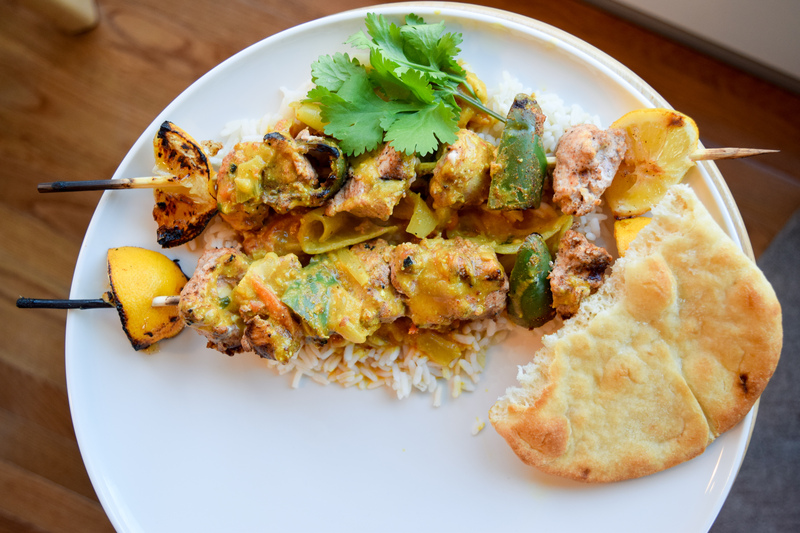 This Chicken Tikka Masala blew my other attempts at curries out of the water. The chunky, flavorful, savory sauce with the charred, spicy chicken is FANTASTIC. The unexpected combination of all those spices is just incredbly delicious. Pair it with some nice fluffy rice and warm naan bread. My husband couldn’t get enough of this one! 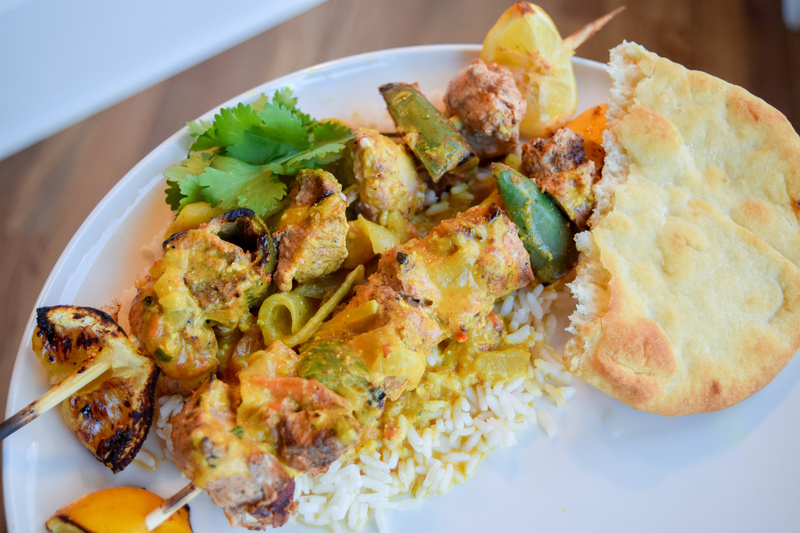 This is very much a British-inspired curry and the ingredients are not difficult to find. You may need to update your spice cabinet a bit, but the rest of the ingredients are pretty straightforward. If you are looking for a good garam masala, try checking out Whole Foods. I love their store brand. It smells and tastes divine! TIP: I grilled the chicken with the peppers but served them separately for those with low levels of spice tolerance. Also, the 1-2 fresh chiles in the sauce is entirely up to you. Those chilis are all about heat, so if you’re nervous, leave them out! Put cloves, cumin, one teaspoon of paprika, and one teaspoon of garam masala into a small frying pan and toast for one minute. Pour into a large bowl. Finely grate in the zest of one lemon, squeeze in all its juice, crush in the garlic, peel and finely grate the ginger and add the yogurt and one teaspoon of salt. Stir together. Cut the chicken breasts into one-inch chunks and massage the marinade into the chicken. Quarter the lemons and seed and quarter the jalapeños. Then alternate putting the chicken, lemons and jalapeños on the skewers, making sure not to crowd the pieces. Cover and refrigerate for about four to six hours. For the sauce, peel the onions and quarter them. Peel the garlic. Put 2 tablespoons of olive oil in a large heavy pot and turn the stove to medium. Put the onions and garlic into the pot and cook for twenty minutes, until golden, stirring every so often and watching for burning. Add more olive oil if the onions start to stick. While the onions and garlic are cooking, toast the almonds on a sheet pan in the oven for five minutes. Then grind the almonds in a food processor. Add the ground coriander, cumin, turmeric, and remaining one teaspoon of paprika and one teaspoon of garam masala to the onions. Cook for two minutes. Add the ground almonds. Crush the tomatoes with your hands and pour the tomatoes and their juice into the pan. Crumble in the bouillon cube, and add 1 1/2 cups of water. Bring the pot to a simmer. The garlic cloves should be soft and falling apart by now, but check them to be sure, as you don’t want to eat a whole clove of garlic. Then stir in the coconut milk and two tablespoons of cilantro. Simmer for another twenty minutes. Add salt to taste. Grill the chicken skewers on medium high, turning once, for about ten minutes. 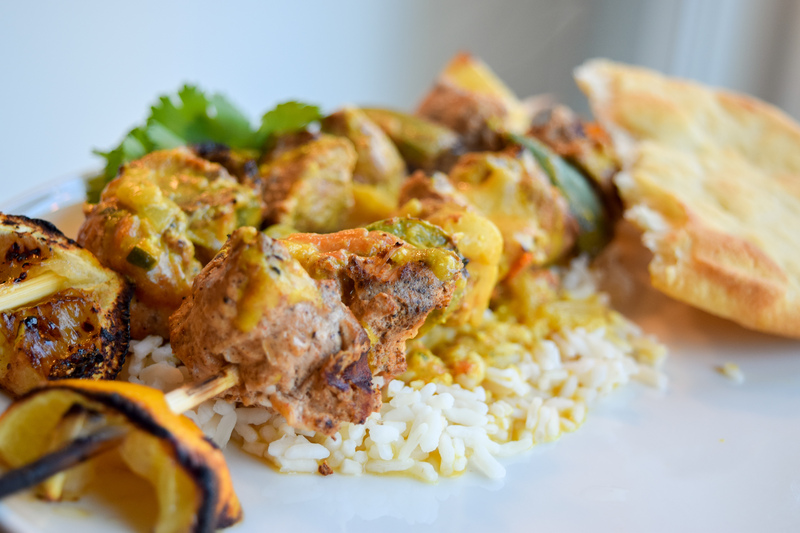 Pull two or three pieces of lemon off the skewers and squeeze the juice and pulp into the sauce and stir. Place the skewers on some rice and pour the sauce overtop. Sprinkle with more fresh cilantro if desired. Enjoy! Tags: Chicken Curry, Chicken Tikka Masala, Curry Sauce, grilled chicken, Jaimie Oliver's Chicken Tikka Masala, Tikka Masala. Bookmark the permalink. I love British curry dishes! It looks wonderful! Tikka Masala is my favorite! I’ll definitely have to try this recipe soon. 😊 Thanks for sharing! I love meals like this. The colours! Your welcome! I hope you like it!